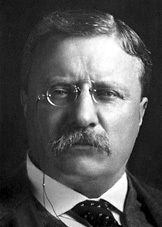 President Theodore Roosevelt preferred to perceive the world through the five senses of sight, sound, smell, taste, and touch, which explains in part why he was an avid outdoorsman and a concrete communicator. Eagle eyes (sensing types), which account for about 70 percent of the population, are practical and realistic, interested in the here and now, and more factual than conceptual. They learn by familiarization, seek physical sensation, and trust experience.